Celebrate the season with six exciting bookmaking projects for Christmas, Diwali, Hanukkah, and Kwanzaa. It's easy and fun to do with clear directions, accessible materials, and reproducible images for all. Make a four page accordion book with a ribbon tie. There are images provided for a Hanukkah menorah, a Kwanzaa kinara, a Christmas tree, and dipa, the clay lamps that are lit for Diwali. Here is another book about Festivals of Light celebrations and customs. The fun part is that the pages are shaped like triangles. 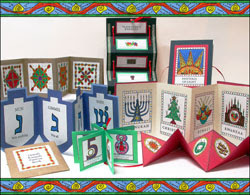 Create an accordion book about the dreidel game. The four front pages of the book are for the dreidel letters and their meaning; the back two give directions for the game. Six symbols of Kwanzaa are placed on the seventh, the mkeka or mat, throughout the holiday. This book about the seven symbols can be spread out on a table or hung on the wall for display. Make a small Twelve Days of Christmas Book that can be used as an ornament with a ribbon loop. Colorful designs called rangoli decorate the doorways and floors of homes, shops, temples, and restaurants during Diwali. Make a simple four page accordion with an envelope to hold your designs. I have just happened upon your beautiful blog and wanted to tell you how much I LOVE your ideas and art work! I have added you to my list of Blogs that inspire!!! Thank you.